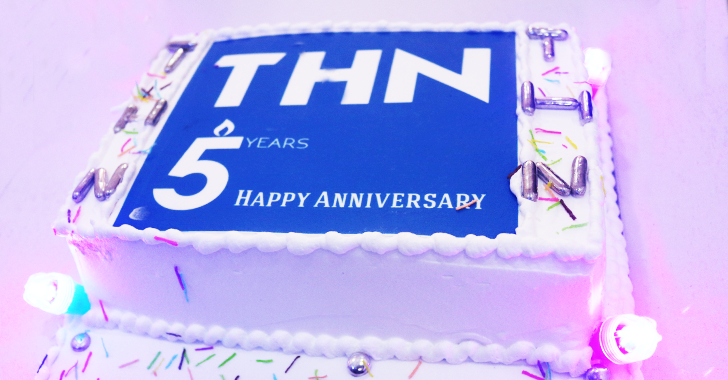 It’s Party time for all of us, as The Hacker News (THN) is celebrating its 5th Anniversary Today. And what an epic 5 years it has been! We began our journey on this same day back on November 1, 2010, as a dedicated news platform for Hackers, Security researchers, technologists and nerds. And just because of your support ‘The Hacker News’ has become one of the World's popular Hacking and Technology News Platform that went from ~100,000 Readers to more than 4 Million unique monthly readers. So now it's time to Celebrate… and most importantly, Congratulate you all for the success of THN. Thank you all for your enthusiasm, contribution, support, sharing, love, time and efforts as well. We wouldn’t be here, five years on and still going strong, if you didn’t support us too. We don’t cover everything, never did, never could, we just publicized the things our regular readers and we were interested in. That is the actual difference between ‘The Hacker News’ and a full-fledged News Outlet. However, as things are changing so quickly on the Internet, we at THN are working on a new platform that will completely transform the way we report and deliver latest Hacking and Cyber Security updates, technology news, and knowledgeable content to our readers. As we are celebrating our 5th birthday today, we promise to continue our work hard in order to improve our Platform and provide the best possible experience. and around 240,000 Twitter Followers. Regardless of how frequent you visit our site, whether you are a regular reader who reads every since article or just occasionally come, whether you support our site by sharing articles, or by being a silent reader. If You weren’t there, THN would not be there without you and probably have never achieved these milestones. We’re excited for the next 5 and here's to many, many more exciting years ahead! Heartiest thanks once again to all of you and please let us know if you have any feedback in the comments below.